Is being a thief better than being a squatter? 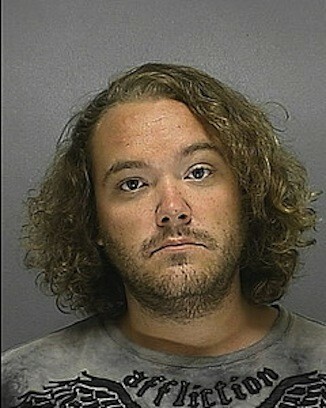 A homeless man allegedly stole $1,375 in cash by renting out a vacant home in Ormond Beach, Fla., so that he could afford a place to live, MyFoxOrlando.com reported. Eric Sisson, 27, (pictured at left) listed the foreclosed home on Craigslist, claiming that he recently purchased it. Sisson found a 19-year-old Daytona Beach woman willing to rent the house and collected $990 in cash from her as a deposit. However, she sensed something was awry and asked for her money back. Sisson returned her money in the form of a check, but the bank informed her that it was linked to a closed account. After the woman's father visited the house, he called police. That's when cops discovered that the original homeowner didn't know Sisson and hadn't authorized him to rent out the house. By this time, another woman, a 29-year-old from Ormond Beach, had also fallen for Sisson's scam and had given him part of the deposit, according to MyFoxOrlando. When Sisson showed up at the house to collect the rest of her deposit, police arrested him. Sisson admitted to police that he didn't own the home and had been scamming the victims in order to get money to find a place to live. He has been charged with obtaining a property by fraud, uttering a worthless check, unarmed burglary and grand theft. He also already had a warrant out for his arrest from neighboring Brevard County for driving with a suspended license and worthless check charges, and a warrant from Indiana for forgery and grand theft. The real estate world is seemingly full of scammers. To find out how to avoid similar Craigslist rental scams, see our story here. Private lending is also ripe ground for scammers. See how toavoid falling for private loan scams here.